At the beginning of the summer, I had two biking goals: ride a century and the Alpine Loop. If you've been following along, you know that I rode the ULCER Century in August. I rode the Alpine Loop on Friday and had a great time. The fall colors were simply spectacular. The yellow aspens were so bright that they almost hurt your eyes to look at them. It was a little cloudy and cold, but there was almost no wind and that made for a very nice ride. The Alpine Loop is a highway (US92) that goes from Provo Canyon, past Sundance Ski Resort, over a 8200 foot summit and then down into American Fork Canyon. Round trip, from my house, was almost exactly 40 miles with a 3500 ft elevation gain. 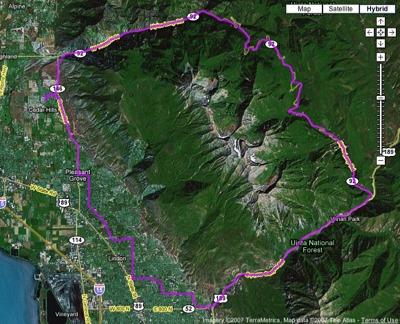 You basically ride all the way around Mt Timpanogos, the 11,500 foot peak that dominates the Utah County skyline. Click on "hybrid video" in this Google Maps view of the Alpine loop to get an idea. The hardest part is the two miles from US189 in Provo Canyon to Sundance--a nearly 1000 foot elevation gain in just about 2 miles. After that it's fairly tame. The ride down the other side, of course, is a lot quicker and tons of fun. Now that I've done it, I suspect I'll do several times per season. It's a fun ride and great exercise--I burned about 3500 calories according to my heart monitor. I took some picture with my iPhone--not great given the low light situation (cloudy), but they'll give you and idea.